On 13 March 2015, the World Sindhi Congress will hold a rally to protest against the human rights violations occurring in Sindh. 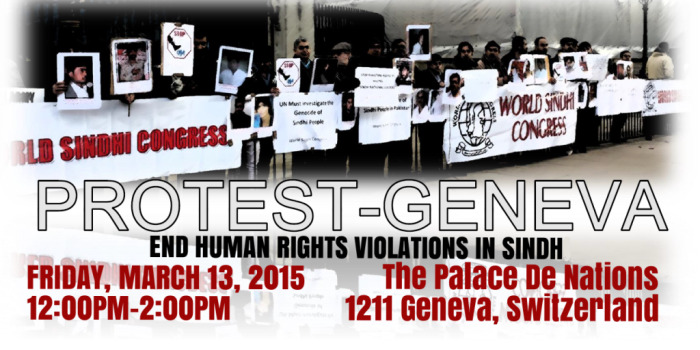 This gathering will take place in front of the United Nations Office in Geneva. In the Sindh province of Pakistan, Sindhis are persecuted by the Pakistani Army and the Inter-Services Intelligence. Human rights violations are conducted by Pakistani security forces both for political and religious motives. Forced disappearances, torture and killings are used as weapons against Sindhi activists. Young children are being kidnapped and often forced to convert to Islam. The World Sindhi Congress works for religious tolerance, human rights and national self-determination for the Sindhi people. This event is aimed at raising awareness about the tragedies occurring in Sindh and calling the United Nations to condemn these acts and pressure the Pakistani Government to protect the rights of minorities and make sure that those who violate them are held accountable for it. The event will take place from 11am to 2pm on the Place des Nations (in front of the Palace of Nations) in Geneva, Switzerland. The Palace of Nations is currently hosting the 28th Regular Session of the Human Rights Council, which will conclude on 27 March 2015. To view the poster of the protest, please click here. Image courtesy of the World Sindhi Congress.